We have some well-established ways to start, monitor, and manage virtual servers and storage. The networking side has less in place for easily deploying and modifying Layer 2-4 connectivity through complex physical topologies. Software-Defined Networking or SDN aims to better manage physical and virtual network infrastructure. In order to make sense of the following, you will need to understand IP addressing, subnets, VLANs, the distinction between switching and routing, TCP and UDP ports and how they're used by firewalls to enforce policy, and more. Start with my page on networking fundamentals and terminology if you need to get up to speed. One striking feature of SDN is its use of generalized packet-forwarding devices. In the traditional OSI model we say that a repeater cleans up and relays signals at Layer 1, a switch forwards frames across a network link using Layer 2 hardware addresses, a router does hop-by-hop forwarding from network to network using Layer 3 IP addresses, while a firewall uses Layer 4 UDP and TCP port numbers (in addition to Layers 3 and 2) to make policy decisions on whether or not to forward a packet. SDN uses devices that we call switches although they base forwarding decisions on Layers 2-4. This misleads some people into thinking that any Ethernet switch supporting VLANs will also support SDN, but that's just not true. We're stuck with the name switch, we can't go back in time and say "Hey, why don't we call these 'Fast Forwarders' to avoid confusion?" Applications can request traffic flows of desired connectivity and performance. They may do this directly through the API (or Application Programming Interface) of the controller through the northbound traffic. There may also (or instead) be an orchestration engine on the northbound side, which might be considered the management plane. The controller sends configuration commands to the Layer 2-4 switching through the southbound traffic. This may be physical switches, or it may be a layer of virtualized switches on top of physical infrastructure. Virtual switches running within the same hypervisor communicate directly with each other. In order to communicate across physical platforms, from one hypervisor to another, or possible between a virtual switch and a physical one, the traffic is tunneled or encapsulated. Virtual switches include VMware Nicira and their proprietary vSwitch running in ESXi, Cisco's virtual Nexus 1000V, Microsoft's Hyper-V virtual switch, and the virtual switches within Linux KVM. This can get confusing, as Cisco's Nexus 1000V virtual switch can run on VMware, Hyper-V, and Linux KVM virtualization. Open vSwitch defines an open-source virtual switch. We might call these "hosts" but that gets confusing: do we mean IP host in the networking sense of a device that can communicate by IP datagrams, or do we mean a virtualization host, a hypervisor on which virtual machines can run? Let's just say "devices connected to the network." The devices are connected to the switch fabric. These are the servers, the clients, and other devices such as printers, phones, cameras, and more. Traffic between those devices is called east-west traffic. That's the general model. Different implementations vary in their details — the controller itself, the API for northbound traffic, the protocol for southbound traffic, which components are physical and which are virtual, etc. The following lists the specifics for some of the most popular SDN solutions, with the associated terms, acronyms, and protocols. It also has links to pages with much more background information. This page was meant to be a supplement to Learning Tree International's Software-Defined Networking course. I was the technical editor of the course, which was authored by Ola Sigurdson. Despite SDN being a hot topic at the time, Learning Tree was unable to sell it to the right audience. SDN is not a new concept. 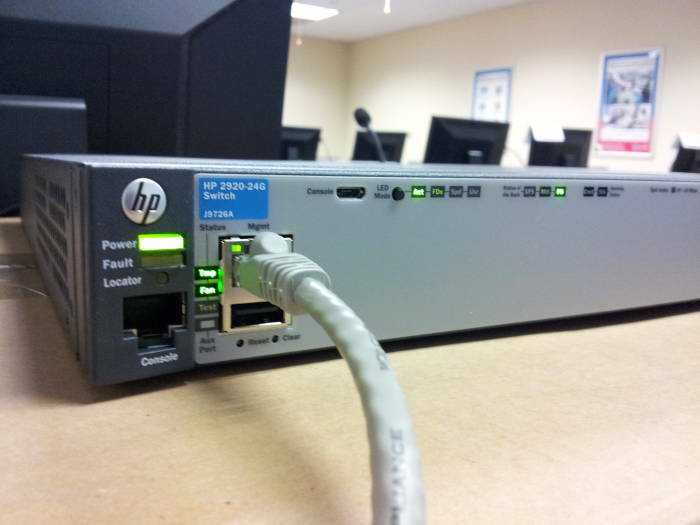 QoS routing, ATM, MPLS, tag switching, IntServ, DiffServ, and other projects have been earlier work in this area. Network Function Virtualization or NFV is closely related to current SDN projects. VLAN or Virtual LAN technology and, of course, IP addresses and subnetting are fundamental supporting technologies you must understand before SDN can make any sense to you. Network World review: Is White-Box Switching the Future of Networking? The OpenDaylight project was founded in 2013 as a community-led industry-supported open-source framework. Cisco has been a reluctant and late addition, recommending their excellent but proprietary solutions. The OpenDaylight model is a descriptive one, documenting what has been found to work, as opposed to a prescriptive one specifying in advance what must be done. The northbound interface is REST web programming. The applications can be written in Java, Python, .NET, and other languages. 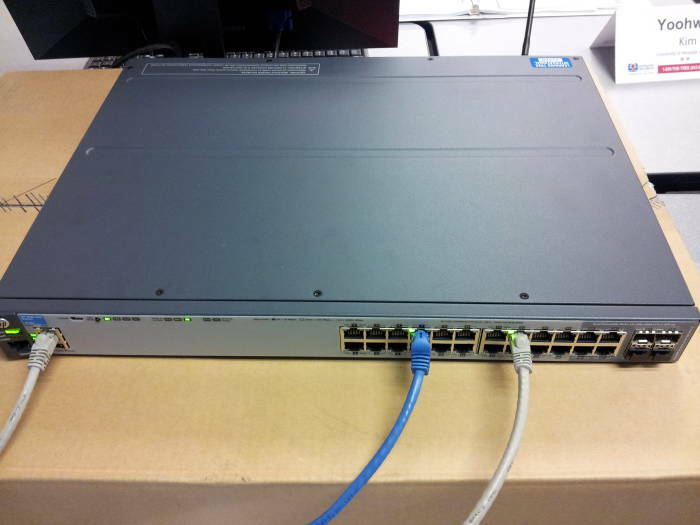 The OpenFlow switching specification is the southbound interface. It defines how a controller can change the operation of network devices. It was developed at Stanford University and is now overseen by the Open Network Foundation. The specification states "OpenFlow is based on an Ethernet switch, with an internal flow table, and a standardized interface to add and remove flow entries." OpenFlow uses TCP port 6653, preferably with TLS for data security. 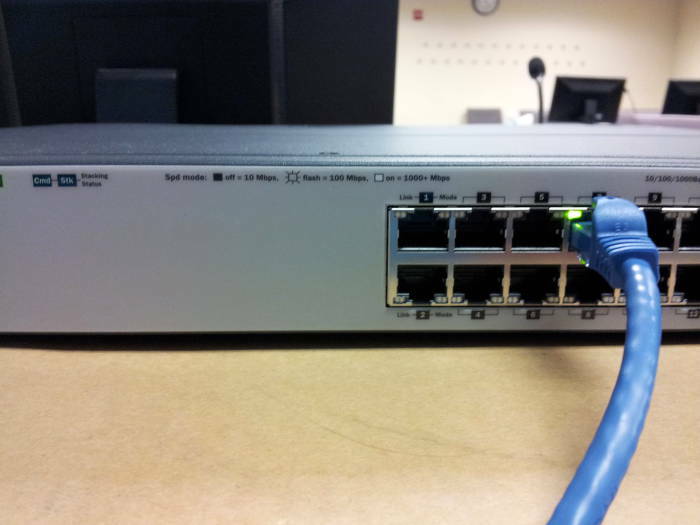 The connection is made from the an OpenFlow switch to one or more OpenFlow controller. 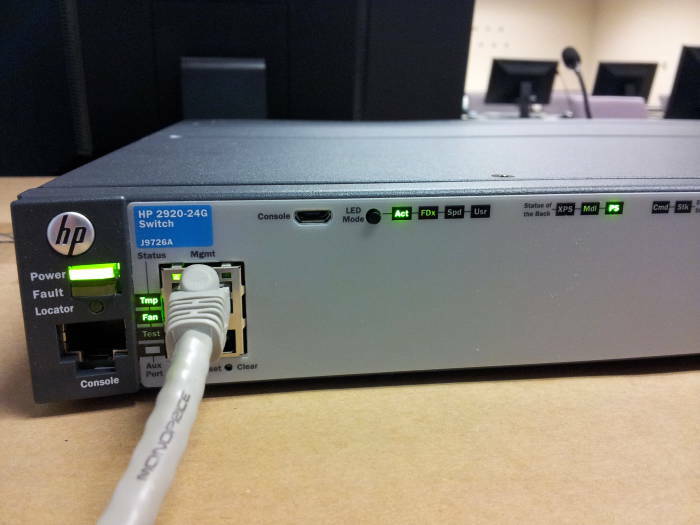 Here's an example on an HP 2920-24G OpenFlow switch set up in a very liberal way — open SNMP, no TLS configured, two controllers. "Going With The Flow: Google's Secret Switch to the Next Wave of Networking"
Speaking of astrophysics, the Large Hadron Collider project uses OpenFlow to manage petabyte data flows. Big Switch Networks is a spin-off of Stanford University. They have released Project Floodlight, an Apache-licensed open-source OpenFlow controller. See the Open Networking Foundation's list of OpenFlow products for more controllers. The fabric-based model uses OpenFlow traffic directly to hardware. 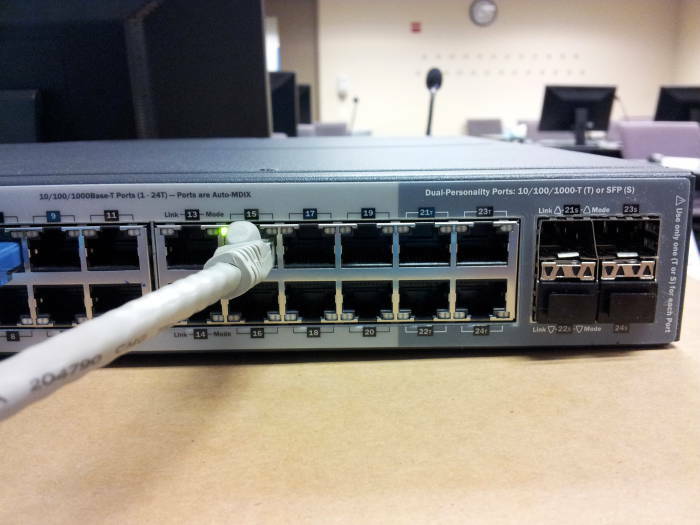 It needs a compatible physical network, so it likely requires upgrading much of the Ethernet infrastructure. Mininet and Estinet are SDN simulators. The overlay model encapsulates and tunnels between virtual switches over your existing physical network. Encapsulation is done with NVGRE, VXLAN, or similar protocols. An orchestration engine (e.g., OpenStack, CloudStack, VMware vCloud suite) talks over the northbound API to applications and users, and over the southbound protocol to network virtualization (e.g., VMware NSX). 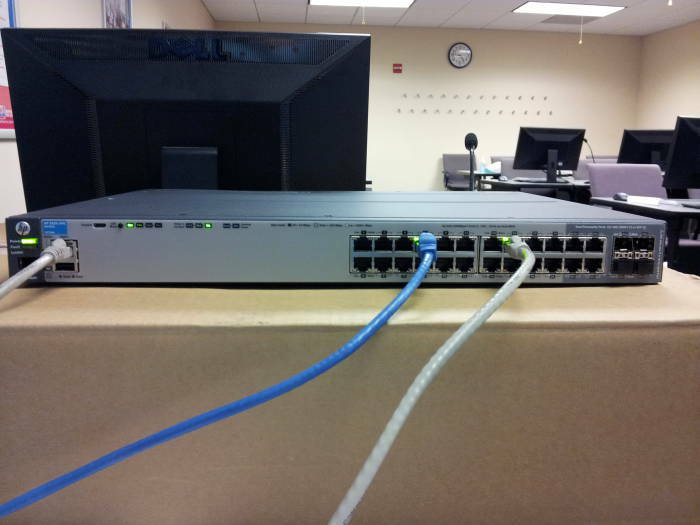 Cisco's Application Centric Infrastructure or ACI runs on Cisco Nexus 9000 series switches. The network controller is the Application Policy Infrastructure Controller or APIC. This gets a little confusing. There used to be a company named Nicira which did SDN with their own proprietary versions of OpenFlow, Open vSwitch, and OpenStack. They had a controller named NSX. Then VMware bought them for $1.26 billion in 2012. The Open* projects went away, and NSX became the name of the VMware vSphere SDN controller. NSX software licensing is expensive, around $5000 per controller CPU or $50 per virtual machine per year. In October 2016 VMware and Amazon announced VMware on AWS. It includes cloud-optimized versions of vSphere, VSAN and NSX. You can spin up a VMware cluster with an entire VMware Software-Defined Data Center stack in the AWS Cloud. You can manage it with vCenter, you only need vSphere in your data center. Juniper forum article: Is VXLAN the Answer to the Network Virtualization Question? The Microsoft SC VMM or System Center Virtual Machine Manager is the SDN controller. Overlay encapsulation is NVGRE or Network Virtualization GRE, a variant of the traditional Generic Router Encapsulation or GRE. This uses XML JSON API for the northbound traffic, and OpFlex for the southbound traffic.